Muthuswamy Dikshitar – find it hard to pronounce? Okay, we shall refer to him as MD from now on. MD (1775 – 1835) is one of the 3 composers widely known as the Trinity of Classical Music, the other two being Thyagaraja and Syama Sastri. MD’s compositions as such will have such identification patterns, viz..
MD was born in Thiruvarur, the same place that bore Thyagaraja and Syama Sashtri. I guess some magic about the place gave us such masters of classical music! And his first song was Sri Nathadhi Guruguho on Lord Muruga of Tiruthani in the raga mayamalava gowla. The song had the entire 8 lines of charanam starting with the same syllable sounding very rhyming. From then on there seemed to be no stopping him. He has some 500 plus songs to his credit. One specialty of MD is he has taken up a particular God / Goddess in a particular temple and written songs on them, the temple, its history, geography, mythology, culture… Most of the details you need to know about the God can be known from the corresponding MD krithi (composition). If that was not enough, he has written series of songs on Navagraha (heavenly bodies), Kamalamba Nava Varnams (9 +2 songs on the same Goddess, apt to sing on Navarathri days), Vibhakthi kritis on various deities. From the looks of it, I think almost all his compositions can be categorized and bunched up into a series. Vibhakthi can be roughly equated to prepositions in english (vetrumai in tamizh) – viz., of the God, for the God, by the God, and so on. He had a sudra disciple called Thambiyappan – should have been a rebel even in those days. He had been so devout to meditation, but his kin thought the reason to be his first wife being dark-skinned, and made him marry a second time And even after that, he was meditation-bound! It is said that he has cured diseases by his compositions – music therapist of old days. His last composition was Meenakshi Memudham Dehi. 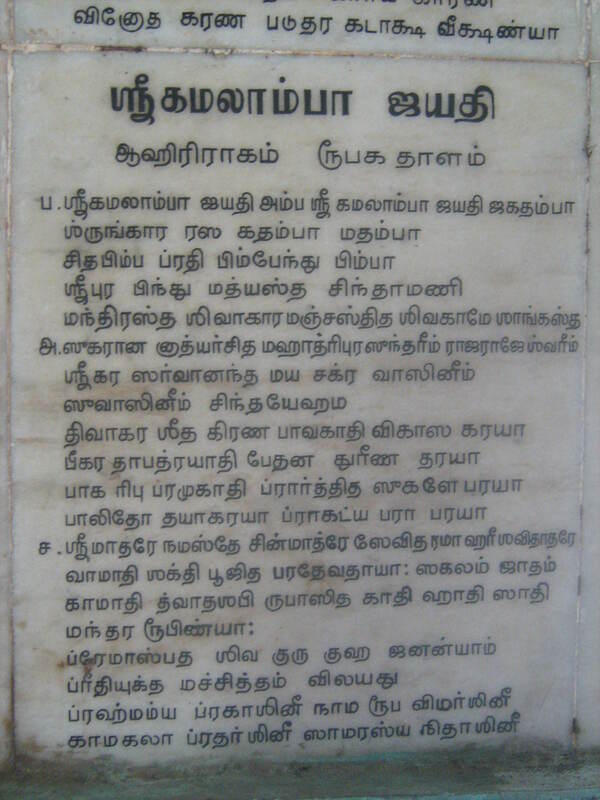 He sang it in Madurai, came back to Ettayapuram and taught it to his disciples. The next day, there was a rougish elephant that went beresek and created havoc in the city. As MD predicted, later it silently went to the mortuary and lay in a spot. The next day (on Diwali), as MD’s disciples were singing the same song, he passed away. It is said that he was buried in the spot that was reserved by the elephant. Also, there seems to be this list of 72 melakartha ragas that are not the sampoorna (SRGMPDNS-SNDPMGRS), but categorized based on no specific set of rules. Some ragas had skipped, repeated, discordant notes. This methodology is supposed to have been used by the MD school of music. Reference: Wiki and Muthuswamy Dikshitar Keerthanaigal by Sundaram Iyer. This is a chain love story as a part of CBC (Chennai Bloggers Club) chain story relay. In this we write a love story as this month is for love. 20 Bloggers will write one chapter of a love story to make a beautiful love story. 🙂 How do you know it will be a beautiful story? Never mind, Love stories are beautiful. A: Hi, that was quick! Sapient? :O That wise, are we? G: It also means attempting to appear wise..
A: Ah, okay wise man 😛 What is it with the eyes?? G: I generally don’t look into eyes and talk.. that’s what people complain.. But yours were inescapable!!! That was the last line of chat that Guru was able to see for nearly a week now. He did not initiate any further conversation, worried that he had crossed the line. It was 13th Feb already and he was to start for Bangalore that night for an official work. But he did not have the heart to go. He was wishing he had not seen her. At the same time , he did not have the guts to get back and talk to her. She had not accepted his friend’s request yet. He did a last try. After 6 hours of constant checking for notifications, he got a reply. A: Do you wish me a good morning, or mean that it is a good morning whether I want it or not; or that you feel good this morning; or that it is a morning to be good on? G: Haha!! All of them at once.. you read the Hobbit? A: Of course, my favourite. Hey I am sorry about the other day, power shut down at my place. G: (Phew!) So, all set for tomorrow? A: Sweden is going to be my ticket to freedom. Still am not able to believe I am leaving Chennai… So the answer is no, a lot of shopping and packing is still pending. G: Okay.. Hey listen! This time shall we plan and meet? There is a restaurant next to the gift shop I met you in. Meet you there, say, in another half hour? A: Woah, woah! Hold on… We both know it is not possible to meet up now, and you still plan when and where? G: Why not? Oh come on, I am starting right now. Cya soon. A: What if I don’t turn up? G: I know you will.. And he went offline..
Ahalya was wearing a printed orange-white-black full skirt and black shirt. She stood at the entrance of A2B twiddling her car keys and waved when she saw him. He parked his bike and she came by and shook hands with him. She was the only girl he had seen shake hands. They got a table and ordered chaat. He placed the charcoal-drawing paper on the table and pushed it towards her. Her wide-eyed, lit-up face was a treat to watch then. “Thanks!”, she uttered finally. They ate in silence. The waiter kept the bill and she picked it immediately. This is my first attempt at writing a sequel to someone else’s story. For the first part, please read Beginner’s Luck. Aadhi sat on his favourite window seat in an empty bus on his way back home. He loved it when the wind hit his face. His thoughts went back to what happened that evening at the beach. For a minute he thought he might have become one of those wannabes. He never had much interest in sketching initially in school. His mom was an arts graduate and she was a popular artist in their known circle. Her sketches had also appeared in magazines. Aadhi was always proud of his mother’s talent. But the pride did not always top the charts; there were other emotions fighting for the limelight in his thoughts too. Disappointment with himself, that he will NEVER ever be able to be as great as his mom. You know, these skills generally skips a generation. Once he had done a portrait for his friend of his friend’s mom as a favor. His friend hung it in his house, and it was appreciated by everyone who visited. A distant relative, his uncle wanted a reference of an artist and got Aadhi’s contact. It was Aadhi’s dad who picked the uncle’s call. He was reminded of the old man suggesting about art as a profession. He did consider it too. Back then… But he was scared that he would fail. Being the only son, his circle expected him to get a high-grosser job, go onsite, earn loads of money, get settled and do his parents proud. He felt did not have the strength to fight back. And his fickle mind then remembered the old man again.